How do you get your team to become innovative? To generate new ideas? Our default intuition is to ask people what they would like to improve. Well, this is good, but the real question is – is it good enough? Take this photo, for example. How effective would it be in generating good suggestions? How sustainable will it remain over time? Our intuition tells us that if we tell others to do something, they will do it. However, we rarely apply the same intuition on ourselves. 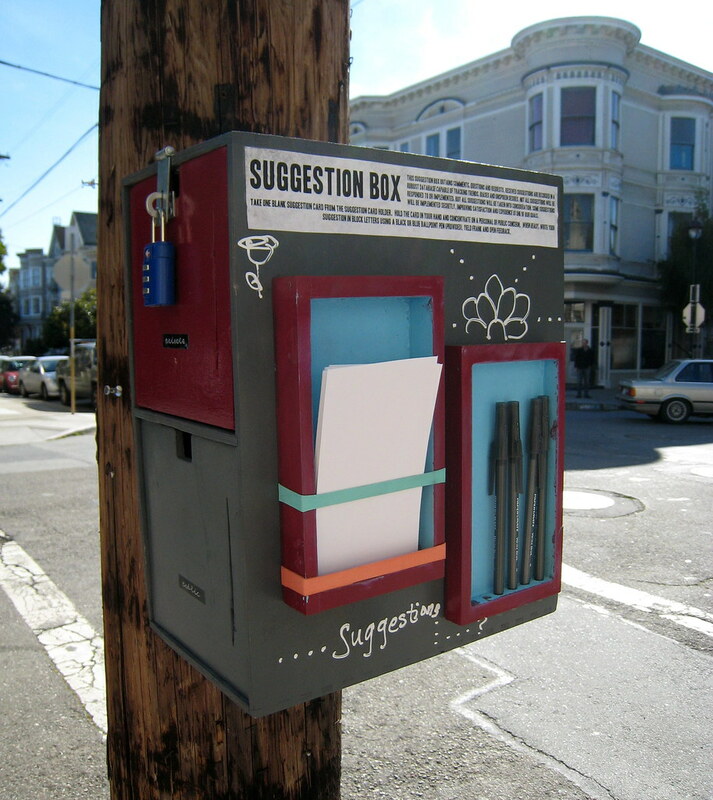 Say someone else put the suggestion box – how inclined would we be to participate and contribute new suggestions? A learning team needs to nurture a learning culture. Think of those two words: nurture, culture. This implies that we need to cultivate it, and provide the fertile grounds for it to sustain. Recently Mark Levison provided us one example of how to overcome technical debt and to increase the team’s evolvement and evolution into a team that learns how to learn. He has used Michael Feathers’ brillirant book, Working Effectively With Legacy Code, to try out techniques of carving out problematic areas of our code, and refactoring them into code that is more maintainable and sustainable. The point is one of courage. Will you be the first to lead this change? If someone is already leading such a transition, or attempting to, will you be courageous enough to join the ride? Take Derek Sivers‘ short clip about the underestimated kind of leadership – being the first follower. The order “Be courageous” in that sense is about the same as saying – put your suggestions in the box. If you are looking for courageous people, think whether you, as a team, are cultivating the atmosphere for such behaviors to emerge. Not sure how to start? Make the first courageous decision, and get educated on the values, principles, and practices that will get you there. Taking a good SCRUM course may be a good starting point. My colleague Elad Sofer is running a SCRUM course at the end of April (as do several others in Israel, and many around the world).